CANADIAN $ - In order to get the quote in Canadian dollars, please put in your dates and press the 'Request to Book' button. The quote will be in Canadian currency. Sorry for the inconvenience!!! VRBO took away the currency converter button. 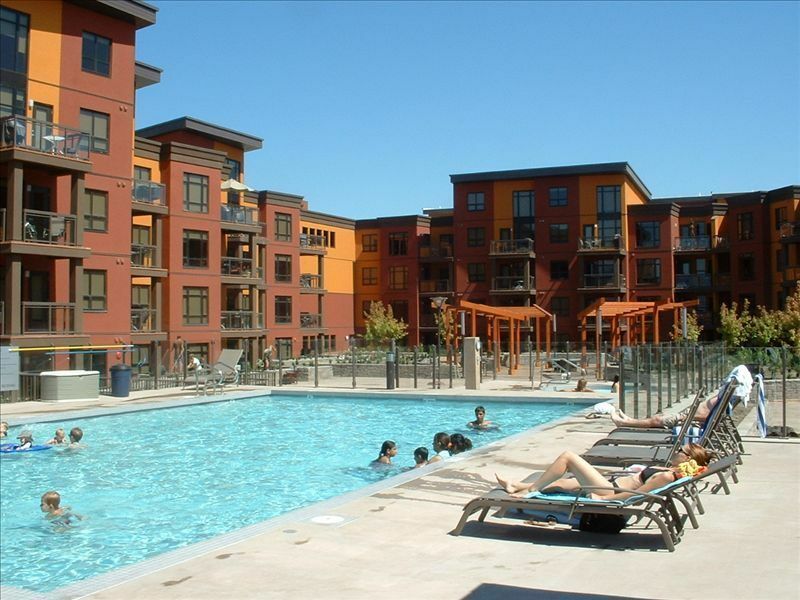 PLAYA DEL SOL is Kelowna's luxury 4* year-round resort in the heart of the Okanagan Valley, just steps from Okanagan Lake with it's popular beaches, walking trails and restaurants. At the end of every pleasure packed day, the comforts of home await you at Playa Del Sol, an amenity rich, energetic community of new resort condominiums. Amenities include a fully equipped fitness centre that overlooks the pool side courtyard. After an invigorating work-out, you can unwind in the luxurious steam room or hot tub or go for a dip in the pool. If you choose to stay in for dinner, you can enjoy your own gas BBQ on your private balcony or cook your favorite meal in one of the two common BBQ areas equipped with picnic tables. If you prefer to eat out, the spectacular on-site restaurant 'Basil & Mint', serving West Coast Continental Cuisine using only fresh ingredients grown in British Columbia. Our luxury 2 bedroom and den suite sleeps 4 adults and 2 children comfortably and has every comfort and convenience just for you. From fully equipped kitchens, comfortable king and queen beds, living and dining area. Free Wifi, TVs, DVDs and CD player are here for your entertainment. The Okanagan Valley is Western Canada's sunniest vacation destination. With it's year around temperate climate, the Okanagan Valley is a perfect year-round destination for anyone who loves the outdoors. The Okanagan Valley offers world renowned golf courses, ski resorts, wineries, water sports, fishing, hiking and mountain biking, or you can sit back and enjoy the beauty of the valley on its own. We have owned this condo since it was first built and we take great pride in our ownership, making sure that all our tenants enjoy their stay to the fullest. We fell in love with this property immediately for its amenities, location and great mountain view! You will enjoy the lovely quiet courtyard and mountain view when you are sitting on the patio, as our condo is located on the 5th floor. Clean, new, spacious and in a great location. Manager was most accommodating with regards to meeting us to check in. There were some complications with the elevators but presumably those are sorted out by now. Great location to both the Eldorado and Manteo hotels but at more reasonable prices. Near the lake and Mission area of Kelowna. Playa del Sol is well kept and has a great private pool and deck area. Would stay there again the next time I am in Kelowna. So glad you enjoyed the condo. Thanks for booking with us and hopefully see you again in the future. Beautiful, clean and spacious place. The owners were very fast on answering my questions. Everything that you need in a house it was there. By the way, thank you for courtesy bottle of wine that you left for us. Much appreciated. The only bad thing was the smoke due to the forest fires. We only had one sunny day. Will go back again. Edmonton, AB. Thank you for your kind comments Hector. We are happy you enjoyed our condo. Nice resort, close to the water and everything else. Roomy condo and well equipped. Very clean. Thanks for everything. You are welcome Glenn. Glad you enjoyed our condo and all the amenities! This was a return visit for the two of us, having stayed here last year. The condo is still the well appointed, comfortable, clean and quiet space. In spite of the lake's high water levels, there were lots of other things to do and see nearby, including the Thursday Jazz and Blues Night at the Rotary Arts Centre. We look forward to coming again next year. Kelowna boasts all the amenities of a major city: fine dining, unique shops, vibrant cultural district and of course 80 mile long Okanagan lake where you can enjoy our many beaches. Rotary Beach just across the road from our condo is a great family beach with a playground and paddle board rentals. Watch the kite boarders on a windy day. Walk along the boardwalk and stop for a drink or a snack at the Hotel Eldorado. Not too far (1 km) is Gyro Beach where the younger crowd can enjoy a game of volleyball. Kelowna City Park just 4km from the condo has a little something for everyone: great beach, volleyball, children's water park, great boardwalk for walking/biking/rollerblading, skate park, lagoons, bird sanctuary, outdoor amphitheatre with great summer entertainment, and more! Many beautiful orchards and award winning wineries (Cedar Creek, Summerhill Winery well known for it's Pyramid - both have fantastic views!) just a 5 minute drive. Kelowna also boasts several championship golf courses (Gallaghers Canyon, Harvest Golf Club...). Up around Gallaghers Canyon is a great mountain bike ride on the old Kettle Valley Railway - you can go on a tour. Just 1 block South of the condo is the Mission Park Greenway fantastic for jogging, biking, walking and goes for miles along Mission Creek. Definitely something for everyone in Kelowna!